If one were to cross 28 DAYS LATER with THE HUNGER GAMES (making sure to tone down the violence to acceptable PG-13 levels), you’d have something like MAZE RUNNER: THE SCORCH TRIALS. This is the second in a series of films adapted from the popular “Mazerunner” YA book series, but even if you’re like me and have never read the books or seen the previous film, you shouldn’t have too much trouble getting up to speed. The film opens with a group of multicultural teens, led by Thomas (Dylan O’Brien), on the run from armed pursuers. The group makes it into a fortified safe haven just in time, but the fact that the guy running the place is played by Aiden Gillen (“Littlefinger” on HBO’s Game of Thrones) is pretty much a dead giveaway that all is not as it seems. Thanks to Aris (Jacob Lofland), member of a previous group of survivors, Thomas learns that their supposed saviors have nefarious plans for them. It takes some work getting the rest of his friends on board, but eventually they come around. 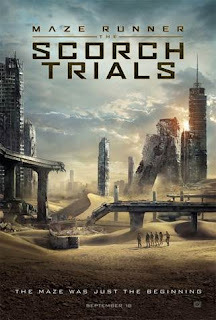 After rescuing token female Teresa (Kaya Scodelario) from some sort of medically induced coma, they set out into the post-apocalyptic wasteland, known as “The Scorch”, in search of a rumored resistance group. After contending with zombies and deadly lightning storms, they discover an outpost run by Jorge (Giancarlo Esposito) and his daughter (I think) Brenda (Rosa Salazar), but it may not be the refuge they were hoping for. As stated earlier, I have not read the book this is based on. I have, however, read the Wikipedia page summarizing it, and from what I can tell a number of changes have been made. I generally try to review films on their own merits and not for how faithfully (or not) they adapt a given source material, but for those who care more about such things than I, it probably bears mentioning. On it’s own merits, MAZE RUNNER: THE SCORCH TRIALS is reasonably entertaining fare. There’s nothing particularly fresh or notable about any of it, but on a comfort food level for those looking for a reasonably well made, well acted, post apocalyptic horror/action hybrid, it’s okay. Beyond the lack of originality and overall so-so-ness of it all, the only real notable gripe I had was that the character of Teresa barely registers in the film, and then winds up being the catalyst for one of the film’s most important plot points. Would it have killed them to give her something to do in the movie up til then? I’m also not a fan of the fast cut editing, crappy CGI, and overall sloppiness of the action scenes, but that’s pretty much most modern action movies so it hardly bears mentioning. Positives? Eh, the cast is pretty good. The film moves along at a decent pace and holds one’s attention for the most part. I’ve seen worse. Sorry, that’s all I’ve got. 2 ½ out of 4 stars.